The NEW E-Motion™ Charge Motor is the latest in Elite’s automation product line up. It offers you top quality performance with a three year warranty! It’s everything you would expect and more in an automated shade. The Charge motor features a completely wireless installation. With a concealed internal battery, absolutely no wiring is required. Everything is neatly tucked away inside the shade for a clean, simple automated solution. 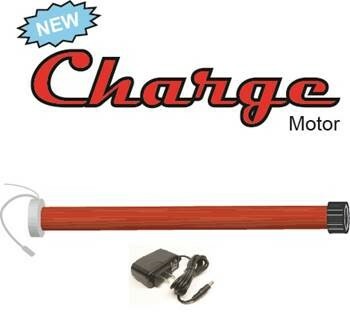 When the time comes to recharge the motor, simply plug the shade in using the wall charger and 6” Charge N’ Go Connector wire (located on the side of the motor). The connector is easily accessible at the side of the shade, but can be kept hidden when not in use. When plugged in, the LED light on the charger will turn red indicating the motor is charging. When the LED turns green your motor is fully recharged. The motor’s battery life will typically last between four and six months between charges. The best part however is, thanks to Rapid Charge technology, it will only take between 20 and 30 minutes to fully recharge. Bet you wish your cellphone could do that. Now, let’s talk style: what type of shade and fabric are you dressing up your window with? The new Charge motor is compatible with Roller Shades, High-Lite® Shades and Sheer Horizontal Shades, giving you access to hundreds of fabrics, styles, and colours to choose from. The Charge motor can be controlled by either a handheld remote control, wall mounted remote control or even from the new Elite Smart Shades™ Wifi Controller. Now you can control the Charge motor along with any other E-Motion™ motor from your smartphone and tablet on iOS and Android. Click here to locate your closest Elite dealer and begin customizing your window coverings today.